Design your own jewelry, then use your laser to bring your design to life! 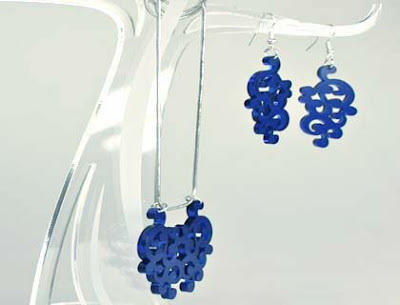 Let your imagination run wild and create your individual acrylic jewelry. Practically any design, can be processed with a laser. Today, we're sharing these lovely files for you to make your own jewelry... All you need is a CO2 laser and acrylic! 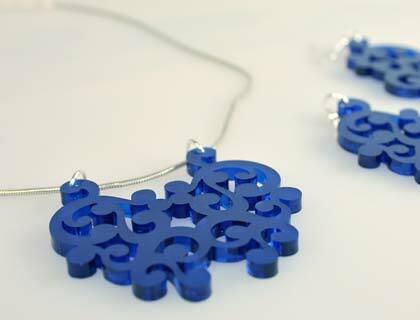 We made the pictured earrings and necklace using the Speedy 300 with a 60W CO2 laser and a 2.0 inch lens. Create your own design or download and use the template we've already made for you. Send it to the laser with the recommended laser parameters. The parameters might vary depending on the machine used and the available laser power. Used cutting parameters: We used 100% power, Speed 1.0%, Frequency 5,000 Hz, and Air Assist ON. Trotec's air assist helps direct derbies away from the material, lens, and promotes air flow. It will help prevent flair-up and improve cut quality. If you would like to make a jewelry stand you can now process the template we provided you, or make your own! Keep in mind, the stand has to be high enough to carry a necklace and have a stable pillar. Used engraving parameters: We used 20% power, Speed 50%, 500 ppi, and Air Assist ON. Used cutting parameters: We used 100% power, Speed .5%, Frequency 1,000 Hz, and Air Assist ON. Use eyelets and hooks to attach the pieces on a necklace. There are special hooks for the earrings. You can find such materials at hobby and craft stores or online at websites like Amazon. Click here to download the templates and JobControl Parameters! We love seeing what our customers create. Share your work on platforms like Instagram and Twitter with #TrotecJewelry we just may give you a shutout for a job well done!